In honor of my upcoming baking class here in San Sebastián at Sukaleku, it's time for another dessert post. My deepening involvement in the world of desserts has only strengthened my belief that the United States has every other country beat in terms of delicious gamut of baked goods. In terms of variety, and sheer deliciousness, there is no contest. Give me a chocolate chip cookie over a financier any day. A muffin over a magdalena. Apple cobble over a tarte tatine. You get the picture. The secret lies in a few things. As far as I can figure, we Americans seem to have little inhibition as far as copious butter and sugar use. This helps. But the real kicker is the brown sugar. This molasses-soaked ingredient gives our desserts a special character. Chewy, sultry, and rich. So today I bring you more proof. This is a cupcake, a whimsical dessert whose fame has yet to spread worldwide. More on that later. 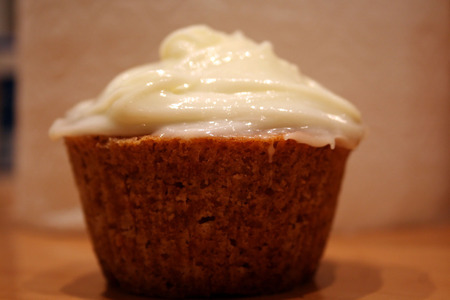 This particular cupcake is carrot-based, rich and deep with spices and brown sugar. One of the small pleasures of life here is talking about carrot cake, hearing the sheer incredulity in your companion's voice but being 100% sure that when they try it, they will FLI-PAR. please email martikilpatrick at gmail dot com for the recipe.